Are you on Right WLC Software version ? Effectively now you have 3 choices. Even though 7.6.100.0 is listed in the above, due to some critical bugs of that version Cisco is working on releasing 7.6MR1 in coming weeks, so you should not run 7.6.100.0 code unless you want to experience those issues 😯 . Also it is mentioned “for complete fix, upgrade to FUS (Field Upgrade Software) 1.9.0.0 as well“. It is very important to make sure you adhere to this. Here is the release notes for this. So What is the best option ? Depend on what version you are running today, you can determine where to go. My preferred choice would be 7.4MR2. But if you are already running 802.11ac (3700AP or 3600 with ac module) then 7.6MR1. If you are still with 4400/WiSM1/2106 then 7.0MR5. Cisco also recommending 7.4MR2 as that code went through “AssureWave” program & tested thoroughly (see the blue star below). 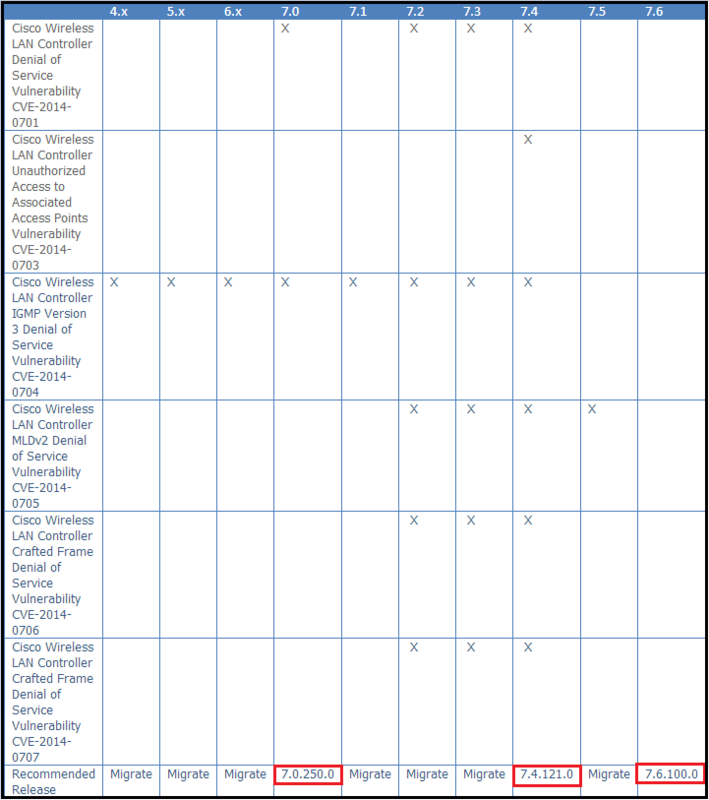 Also you can refer this report for what features tested by Cisco under AssureWave program for 7.4.121.0 code. Be on a safe code version !!!! Update @ 5th March 2014. Cisco has released WLC 8.0 code which is going to be a major release which will last through few maintenance releases (MR). Many thanks for your post. Very useful. Always a moving target. New features/AP’s keep us on our toe’s. It’s 7.6 MR1 can’t come too soon for me. At least now customers have limited options & it is not too hard to pick the right one for them. Hope 7.6MR1 gives you some relaxation…. Excellent article, hopefully it saves at least a few beat testers (err…customers) from the trial and error routine! I am currently using 7.5.102 but experienced no reloads. Should I still make a change or wait for a more stable 7.6 version? 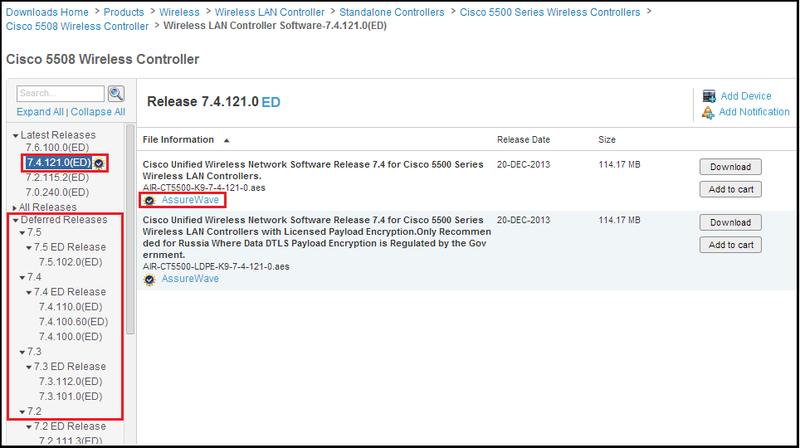 I just checked Cisco Software Download and I see 7.6.110 was released. Any thoughts? Still I think you should move to a supported code. “Reload” may not the only issue, if you read those vulnerabilities, then you will realize moving to a supported version is a good idea. If you are using new features of 7.5.x then move onto 7.6MR1 (7.6.110.0). If any other critical issues with 7.6MR1, Cisco will release MR2 in future. I am using a virtual Controller, could this be the reason of not having any issues? I have version 7.6.110.0 installed on my controller, I didn’t know about any problem with this version until now. I must say that the controller is working fine (up time 90 days) and never restarted by itself, but I experience some issues with the controller not choosing the correct Modulation and Coding Scheme for some clients. I will do the upgrade to MR1 and hope it will solve this issue too. I will do an upgrade to 7.6.110.0 (now I’m running 7.6.100.0) as soon as possible. By the way, you have a very nice blog. you have mentioned a problem with Apple devices on the release 7.6.100.0. We are facing connectivity problems with Apple devices using the vWLC. You must try number of times till the Apple device connect to the network. Can you please share some information about the Apple connectivity problem? hi Rasika , i want to upgrade my WLCs to release code 7.4.121.0, now i am running 7.4.110.0 , i want implement HA AP SSO , but i read about unexpected reloads , could you please give an advice about implementing HA or staying in traditional primary secondary after upgrade to release 7.4.121.0 , OR upgrade to 7.6.110.0 for HA is better ? wifi is very critical in our enviroment, And i also want to thank you for the great blog!!! I haven’t implement HA AP SSO & still with traditional primary,secondary for AP fail over. Unless you want new features/hardware support (ac, 3700,etc) I would stay in 7.4.121.x (In my production I am still with 7.4.x). New 3700 Access point it’s support IOS Version 7.4.121.0. How to configure SNMP on cisco WLC. Dear Friends, I have 5508 WLC 7.4.100.0, MSE 7.4.100.0 3355 & NCS 1.3. Can I upgrade my WLC ios version from 7.4.100.0 to 7.4.121.0 it’s works or not. Or MSE & WLC ios version should be the same it’s required. Hello I want to upgrade my wlc from 7.0.240 to 7.6.120, but am runngin wcs version 7.0.240 will wcs still work after update ? I already did it … but i’m facing a lot of problems …. WCS is so slow , my be it;s a reason of software incompatibility . i need to be sure about that so i start doing downgrading again . Question about FUS. I’m preparing upgrade of my WLC to AIR-CT5500-K9-7-6-110-0.aes. If you have this version of software in WLC you should use this FUS. Or, first install 7.6.x software and then FUS (or vice versa). You can do the process either way, FUS first or WLC software first.Use CLI Method. I just updated a 5508 this weekend from 7.2 to 7.4 and Cisco documentation recommends to also update the FUS (although it doesn’t state it’s mandatory). Can you shed some light about this FUS, why’s so important and some tips we all should know? Maybe on a dedicated article.. The Wireless 8.0 team is pleased to announce immediate availability of Wireless Software Release 8.0 for Cisco Wireless Access Points, Wireless LAN Controllers and Mobility Services Engine. The mobile workspace trend is helping employees and partners embrace mobile technologies, create new possibilities for untethered work styles, enable better customer engagement, and connect with people, information, and services. At the same time, we are experiencing the Internet of Things (IoT), where millions of new devices are regularly being connected to the Internet. Cisco Wireless Release 8.0 delivers a holistic end-to-end IPv6 solution to mitigate the challenge associated with the diminishing number of unique IPv4 addresses available and allows consistent IPv6 addresses for communications throughout the network. This software release also enhances the Cisco High Density Experience (HDX) that alleviates the complexity of more clients, bandwidth hungry applications and high-density network strain, to provide an unparalleled user experience. o Optimized Roaming monitors the connection quality of all devices and proactively prompts poorly performing client devices to seek a better connection much sooner.  IPv6 infrastructure support allows IT administrators the ability to configure the entire WLAN infrastructure with IPv6 addresses and enable the communication between the Wireless Controller and AP, Prime Infrastructure, Radius Server and Mobility Services Engine using IPv6 throughout the network.  Granular per user and per device policies for Application Visibility and Control (AVC) to provide the right access to users and maintain operational costs by properly managing applications and their bandwidth use. o Location specific and per user group Bonjour Policies enable customers to deploy Bonjour at scale by simplifying control of services access by user types without needing to segment users unto different SSIDs or VLANs. In addition this feature allows customer to view Bonjour location specific services available on wired and wireless networks. o Chromecast policies allow deployments over large networks with multiple VLANs while restricting access to a specific group of users.  Service Provider features PMIPv6 MAG on AP and Q-in-Q tagging that provide deployment flexibility for interoperability of Wi-Fi and mobile packet core networks.  A better location (blue dot) experience with more frequent location updates for Wi-Fi clients using CMX FastLocate and CMX Presence Analytics that enables customers to gain insight about visitor patterns in their venues and use it to improve business decisions.  CMX for Facebook Wi-Fi integrated with Mobility Services Engine to enable customers to incent guests with a premium guest experience. 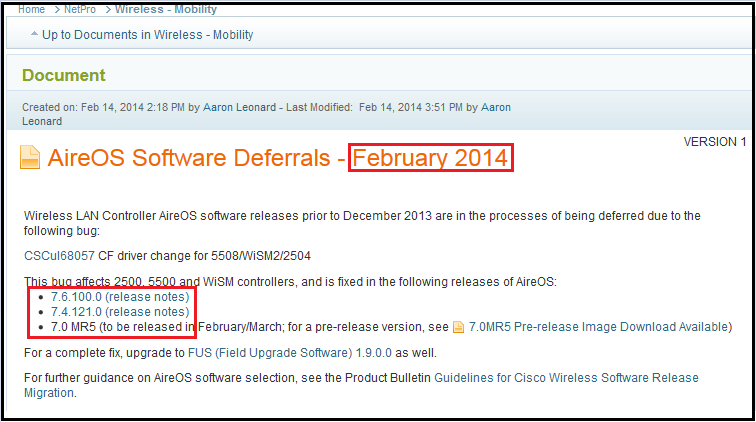 For a complete list of 8.0 Features and benefits, see the attached Wireless Software 8.0 Release bulletin. Our current 5508 WLC software version is 7.4.110.0 and management planned to upgrade it to v8. They also requested to upgrade the FUS of WLC to v1.9. Some of our 5508 controllers are currently having FUS v1.7 and some are having v1.3. I read some articles in the Cisco to gain knowledge for upgrading FUS. But most of them are mentioning FUS upgrade is a quite risky task than the normal software upgrade. My concern is I am in Singapore and we have WLCs across the region. So I will need to do this FUS upgrade remotely. Hopefully you have done some FUS upgrades remotely before and I am glad if you can share some valuable information this regard. I would get a remote laptop connected to WLC console & do this task via console. Only thing is you need to be patient & allow ~30 min to do this process. Log the console session as a good practice. Also make sure you do not power cycle while this upgrade process happening. I think you blog is useful for many of us so it is important to add any valuable information. BTW, I would like to share with you that AIRPLAY does not work on IPAD 2 running version 8.1.x or 8.2.x. When I deployed Apple TV using mDNS, the IPAD were running OS 7 and everything worked fine but once the IPAD 2 were upgraded to any of the previous version I mentioned above, AIRPLAY Icon was not displayed anymore. Now I have a big issue with this because the WLC version 8.0.110 (or 115).X for WLC 5508 fix the problem but this code has a bug that resets/reloads the WLC unexpectedly. No, as part of FUS upgrade , boot loader will get firmware updates. I think FUS 1.9.0 is the latest. See the release notes of these FUS & it will listdown what boot loader version that comes. Iam also preparing to take CCNA wireless exam and iam bit confused from this qestion – which is probably because exam qestion have old WLC or FUS? Correct answer suppose to be A but I cant find such a path in my GUI. If you with 8.0.121.0 code, if you click “Wireless” menu, it will show all the APs register or trying to register to your WLC. In the given question, if you have incompatible (due to upgraded software version) APs which was previously registered, still appearing as “Downloading” in operation status. FUS is Field Upgrade Software is typically required for address certain issues in hardware level of a WLC. Normal upgrade refer to software update to provide some feature improvement, bug fixes in WLC software. 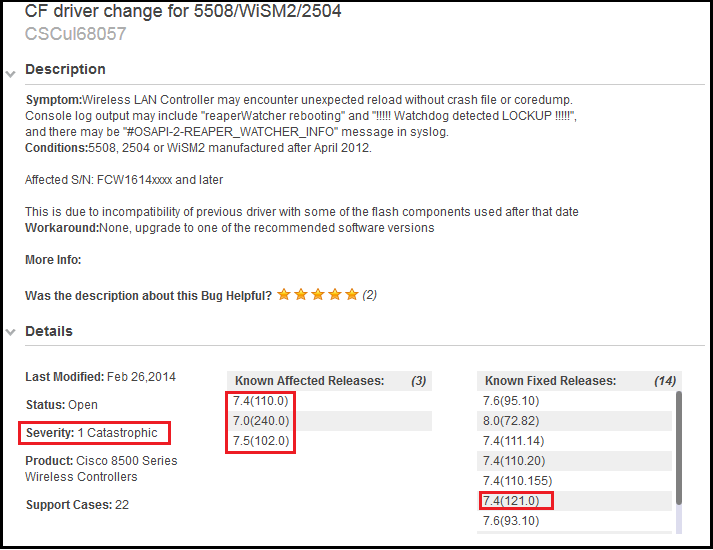 Can you upgrade a 2504 WLC controller from 7.4.121.0 directly to 8.0.121.0? Keep this URL bookmark for any WLC software release notes. i am khalid from germany, please i want xour help, how kann i use wlc 8540 as MC ? Unfortunately it is not supported in 8540. Cisco killed that converged access technology in IOS-XE since 16.3.x onward. So my suggestion is to stay away from it, unless really necessary.